Only two ales - Courage Best & Doombar, but both were fine. Very narrow front bar & separate room at the back. Friendly bar staff. Cheap ham rolls! A small, traditional boozer in a prominent position on the main road. It tries to make the most of it�s location with a string of coloured lights adorning the outside, and this theme continues inside with fairy lights around the bar. The front bar is very narrow, to the point where if there is someone sat up at the bar you pretty much have to squeeze past them to get down the end. It opens up a bit on the right, where there was a plasma on the wall showing the football. There is also a separate room off to the rear. The ceiling was adorned with hundreds, if not thousands, of key fobs which are an interesting feature and there was various other paraphernalia around the place. This is a very cluttered pub! Menu consisted of a few dishes such as beef curry, beef goulash, faggots, etc. all priced at a very reasonable �3.75. If you�re not that hungry, there was a jar of pickled eggs behind the bar. Disappointingly for most BITE readers, there was only one real ale on, namely Courage Best. There was however a very good selection of ciders � Thatcher�s Traditional, Natch, Cheddar Valley, Thatcher�s Traditional and Thatcher�s Gold. Decided to call in on the strength of the model car collection, before our group hit Bedminster. 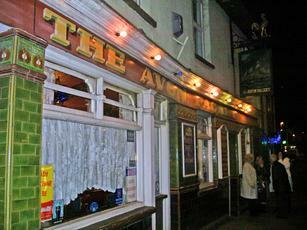 A very traditional male-boozer, you can leave most of you airs and graces at the door. Ladies may need a map to find the loos. One ale on (I forget what, nothing special, maybe Courage) which was OK. There was also some real cider available. Punters were were quite local and gave us a long hard look when we came in but in the end we were accepted with no problem. 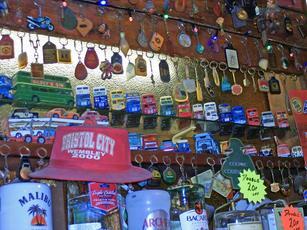 Pub itself is an L-shaped bar, with the toy car collection behind the bar. The exterior has some attractive old tile-work which has escaped the curse of modernisation. TV inside tuned to the football. It isn't necessarily a place I'd recommend to most but would certainly say it's worth popping in for a pint for the novelty value if you haven't been before. On recent visit the only ale on was Courage Best,there were 2 ciders though-Thatchers and Cheddar Valley(sampled-YUM!). And cheap too. Nostalgic,olde worlde,unspoilt pub. If they removed the nicotene stains the place would fall down. So leave it as it is please. Nice pub and recommendable. Over a bridge from the Orchard. Pleasingly retro decor in this place that extends to the prices - nice to get change from �4 when ordering a couple of pints - and free bar snacks. Front room is pretty much a corridor, but does give you the opportunity to admire an immense selection of key rings and dinky cars. There's more room at the back and the opportunity to watch Sky. Only one ale on offer when I visited, so I'd recommend the Thatcher's cider.